I had a cover idea in my head for some years. In fact, one of the first things I ever did was doodle a cover to the game back in 2000 (the original sketch is on my fridge). I used that doodle as the basis for my art direction on the original cover. The artist, hive, took it in his unique direction to impressive results. 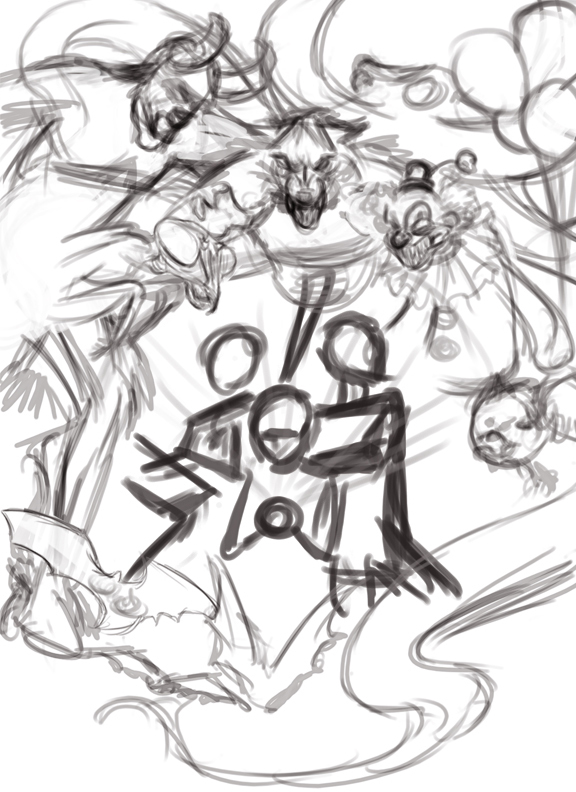 For the Nightmare Edition, I wanted something more literal but with a hint of mystery based on the same doodle. I contacted the incredibly talented Veronica V. Jones (you can check out her work at www.moonshines.com) to see if she’d be available. Once again, the art dieties smiled upon me and she was. I’d worked with Veronica before. She’s everything I want in an illustrator: communicative, on budget, and able to deliver images on spec that carry the elements I look for when hiring an artist. I never hire an artist simply to ape a famous style or turn in a by-the-numbers piece. I hire artists for what they bring: the little touches and features they add to pieces that make them their own. Veronica does this beautifully. One of the things I like most about her work are her faces. She delivers believable, emotive expressions that give characters life and bring pathos and story to her pieces. I sent her a pretty long spec. As I’ve grown as an art director, I’ve become more direct, more specific about what I want. I’m flexible but the piece I’m commissioning needs to do what it needs to do. 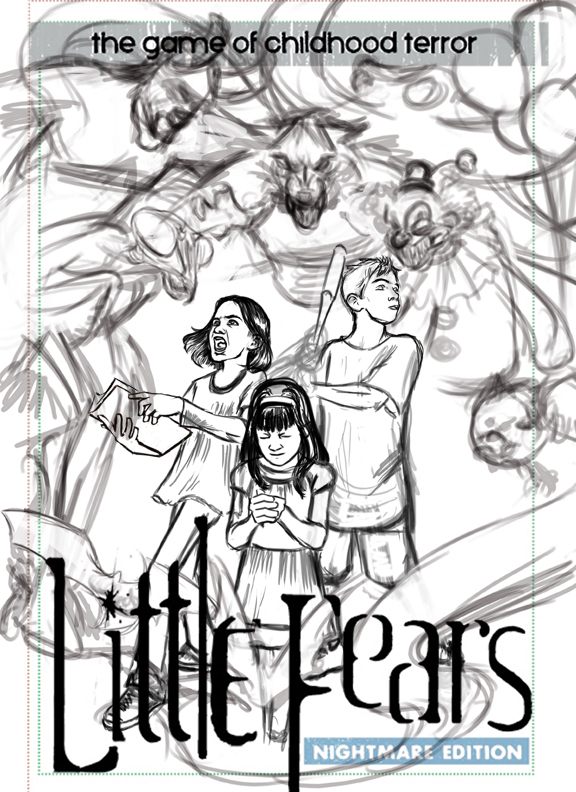 And what this piece needed to do was illustrate two things: this book is about kids fighting monsters and those kids have three weapons at their disposal (belief, hand-me-downs, and sheer strength). I drafted a long (sorry) art spec and sent it to Veronica. 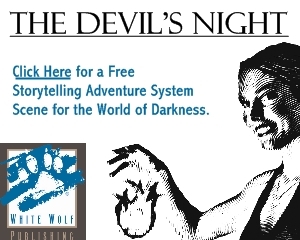 I attached an early logo and trade dress mock-up as well so she could get some context for her illustration. This opened a dialogue so that we could come together on a piece and see where our heads were at. I knew she’d do a good job with the spec I sent. I didn’t expect just how good. This was perfect. Exactly what I wanted. The blocking was good and I could see we were on the right path. The next step was the pencil sketch. This gives me an idea of the illustrative style she’s going for. Right on. The expressions are clear, the monsters look good. A color pass comes next so I can get a feel for the warmth of the piece, see where the light sources are and what they are going to hit, and get a much clearer idea of what the piece will be in the end. Again, she put it in the mock-up trade dress and logo. Composition is good, style is on, color works. Now comes the long wait. Now’s the time when the illustrator brings it all together into the final piece. For the art director, this is can be agonizing. Well, for me as the art director anyway. I’m anxious to see the final piece. 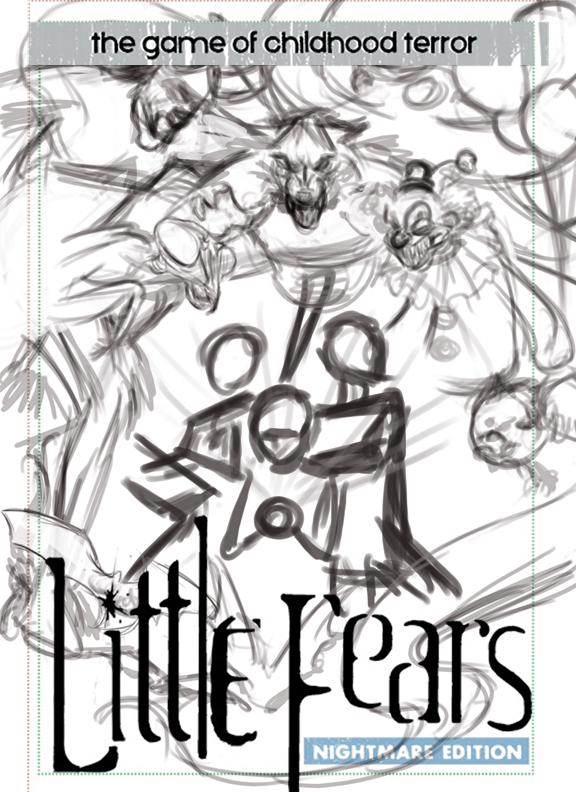 I work on the rest of the cover, the spine, and the back, clean up the trade dress, and hope nothing bad happens in the mean time. I get updates and progress notes and I wait. Then, one day, I get an email. In that email is an attachment. I look, and I am very happy. Very, very happy. I drop into the trade dress, add the final logo, and take a step back. I see if it works or not. I see if anything needs changed. There are some minor tweaks but nothing harsh. 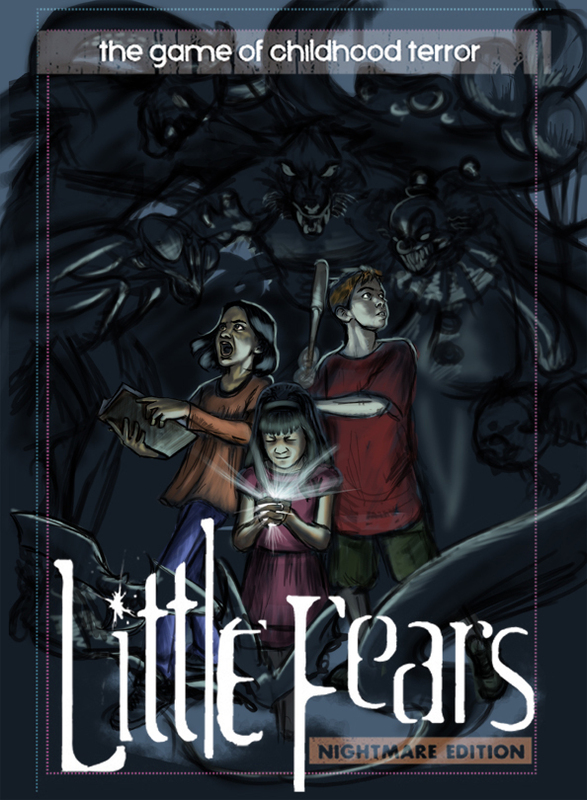 And here it is, minus a few tweaks, the cover of Little Fears Nightmare Edition. Veronica did a fantastic job. 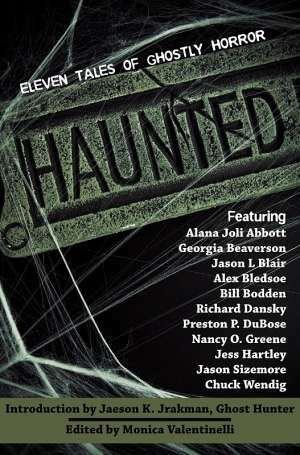 This is a book I would grab off the shelf to see what it was about. I hope others feel the same way. 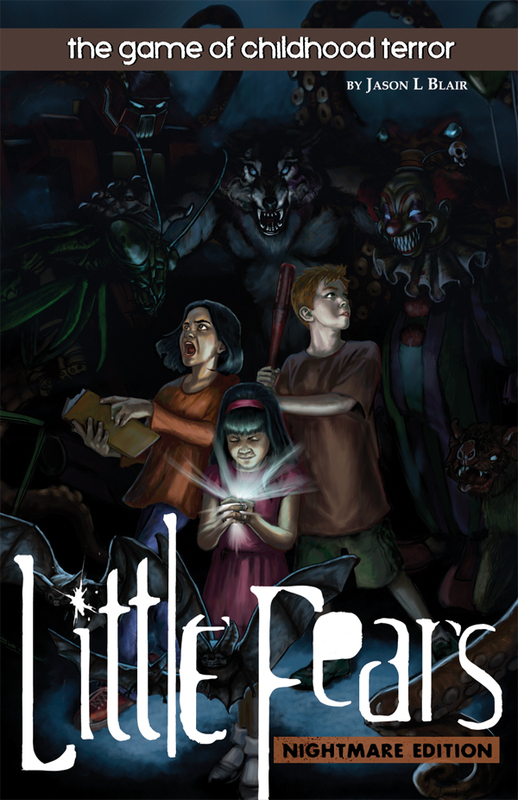 Be sure to check out www.littlefears.com today for another important announcement! Great cover Jason; Veronica was obviously a good choice for this job. Jason, I’m waaaaay behind on my RSS feeds so I’m just now catching up with this news. Just wanted to congratulate you on an awesome cover. You have every right to be proud!